“We are talking little green microbes, not little green men,” said Jay Melosh, a distinguished professor of earth, atmospheric and planetary sciences and physics and aerospace engineering at Purdue. 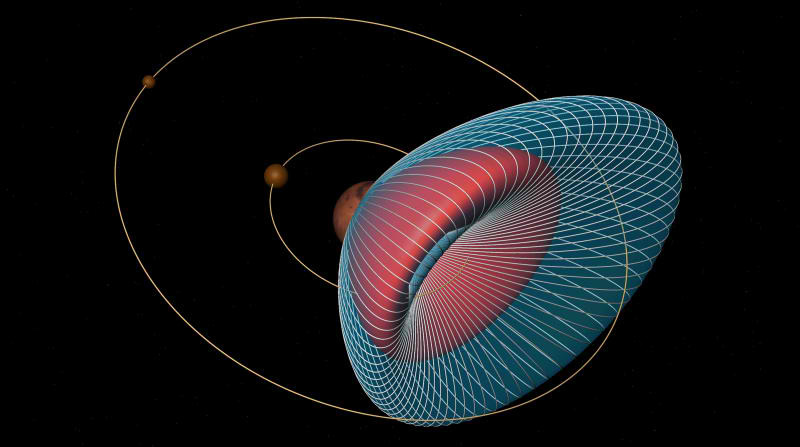 “A sample from the moon Phobos, which is much easier to reach than the Red Planet itself, would almost surely contain Martian material blasted off from large asteroid impacts. If life on Mars exists or existed within the last 10 million years, a mission to Phobos could yield our first evidence of life beyond Earth.”…..
A defunct Russian spacecraft is due to re-enter the atmosphere sometime after midday (GMT) on Sunday, say scientists who are watching its orbit closely. They cannot predict precisely where it will hit the Earth, but say the most likely scenario is that it will splash down in the ocean. However, most of the world’s major cities, including London and New York, are potentially in the firing line. At a briefing at the Science Media Centre in London on Thursday, Richard Crowther, chief engineer at the UK Space Agency, said he was not unduly concerned by the return of the Phobos-Grunt spacecraft. “It certainly doesn’t keep me awake at night worrying about the possibility of space debris coming through my roof,” he said. “If you look at the Earth from space, it’s mostly water. If you look at the land masses, most of the populations are concentrated around the coasts or in certain regions. The spacecraft’s current flightpath will bring it down somewhere between 51.4° north and south of the equator – south of the latitude of Watford in the UK and Calgary in Canada, and north of the Falkland Islands…. 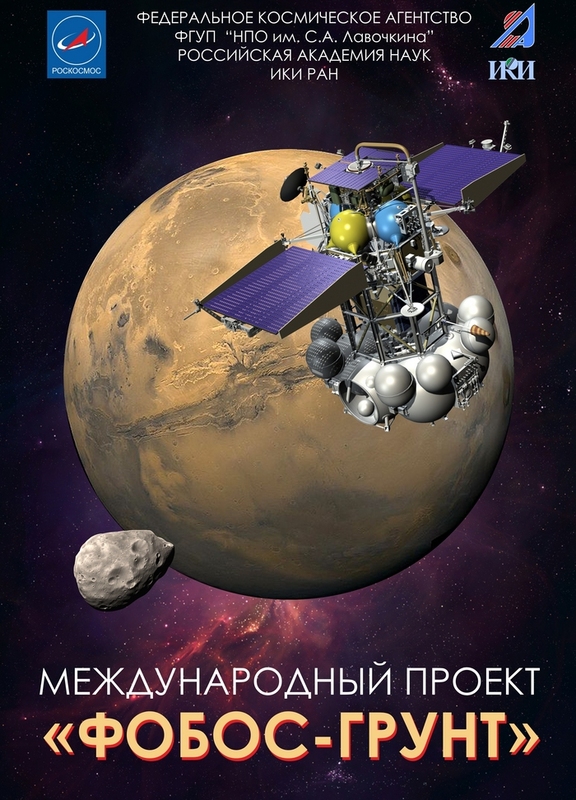 Russia launched an ambitious Mars moon probe, the Phobos-Grunt mission, on Nov. 8, 2011 (EST) on a mission to collect the first samples of the Martian moon Phobos, but the spacecraft was soon marooned in Earth orbit. See how the Phobos-Grunt probe will fall to Earth in January 2012 in the SPACE.com infographic …. Video of a passage of Phobos-Grunt over France on January 1st 2012, at a distance of 237 km. The satellite is moving from left to right and the Sun is on the right, the consequence being that the solar panels (on the left) do not receive sunlight. More details and interpretation on http://legault.perso.sfr.fr/phobos-grunt.html . The 13.5 tonne Phobos-Grunt has been circling Earth since November when rocket boosters failed to ignite and send the spaceship on its journey to the Martian moon of Phobos. The spacecraft suffered a computer malfunction after launch and when repeated attempts to contact the rocket failed, the Russian space agency, Roscosmos, had to abandon the mission. Officials at Roscosmos admitted that 20 to 30 fragments of Phobos-Grunt, weighing a total of 200kg, might hit the Earth. Among the most likely parts to survive are the cone-shaped sample return capsule that is protected with a heat shield. The capsule was designed to survive a crash landing without a parachute. Plagued by an undiagnosed problem that stranded it in Earth orbit, Russia’s Phobos-Grunt Mars mission remained quiet Tuesday after renewed attempts to coax the craft back into contact with ground controllers. European Space Agency officials transmitted signals to raise Phobos-Grunt’s orbit Tuesday in hopes it would allow greater communications opportunities at a higher altitude, according to the agency’s Twitter page. The ploy didn’t work, and the probe remains in a low-altitude orbit less than 200 miles above Earth. Outfitted with a feedhorn antenna designed to attenuate the power of its radio signals, ESA’s Perth ground station heard signals from Phobos-Grunt twice last week. Perth’s 49-foot dish antenna received limited telemetry from the spacecraft. 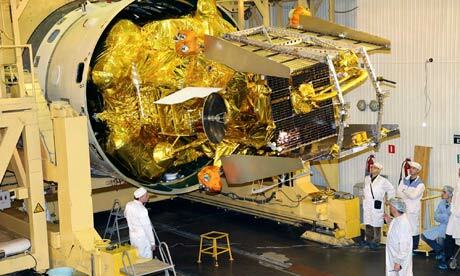 ESA passed the data to engineers with NPO Lavochkin, the probe’s prime contractor. Officials hoped raising the craft’s orbit would lengthen communications passes and give engineers a better chance of recovering the mission, but the commands didn’t work Tuesday. Engineers are adding a feedhorn antenna to ESA’s tracking site at Maspalomas in the Canary Islands. The feedhorn device was added to ground stations to reduce the power of signal transmissions because Phobos-Grunt’s computers may think the craft is on the way to Mars, when radio signals from Earth would be weaker than in orbit. 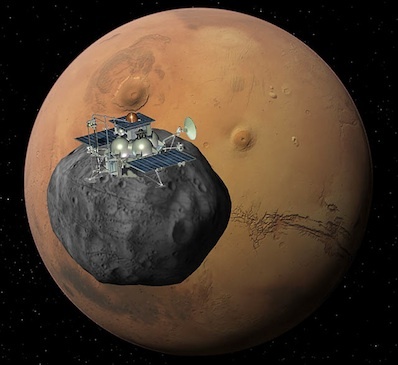 Phobos-Grunt was designed to release a Chinese orbiter around Mars, then touch down on the Red Planet’s rocky moon Phobos and collect samples. 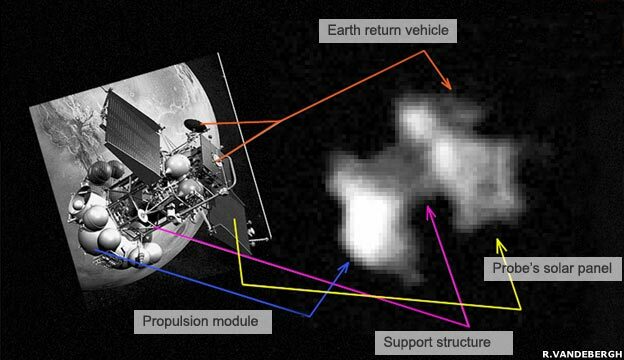 It carries a return vehicle to shepherd the soil of Phobos back to Earth for analysis. Without data to assess the 29,000-pound craft’s health, Russian engineers were left in the dark about why the burns failed. Russia enlisted help from ESA and NASA to contact the probe, but NASA’s deep space antenna in Goldstone, Calif., never received a signal. NASA’s deep space network stopped listening for Phobos-Grunt on Tuesday to prepare for Saturday’s launch of the Mars Science Laboratory. Because Phobos-Grunt’s altitude is so low, experts say the fuel-laden craft will succumb to the affects of drag and fall back to Earth early next year. Nicholas Johnson, NASA’s chief orbital debris expert, said the re-entry may occur in late January or February, but a specific time period won’t be known until much later. Contact has finally been made with Russia’s troubled Mars mission, says the European Space Agency (Esa)………..